Romain Dumas, Volkswagen and the fully-electric I.D. 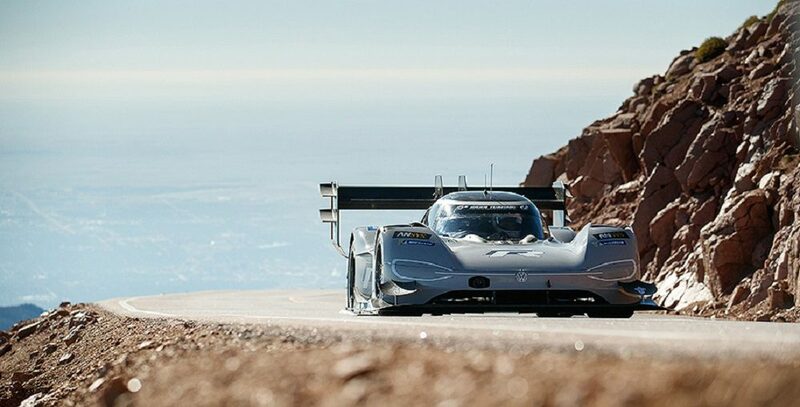 R Pikes Peak made history together at today’s Pikes Peak International Hill Climb! Driving the 500-kW (680 PS) I.D. R Pikes Peak in the unique race up the 12.42-mile with 156-turns,public toll road which climbs from the start at 9,390 ft. to a power-robbing 14,115 ft. elevation, Frenchman Dumas defeated a field including cars with conventional drivetrain technology. In doing so he did not only broke the previous record for electric vehicles, but also bettered Sebastien Loeb’s all-time record from 2013 in a Peugeot 208 T16 by a full 16 seconds, delivering a time of 7m57.148s! This was for Dumas a fourth Pikes Peak victory, to go with his pair of overall victories at the 24 Hours of Le Mans. “The I.D. R Pikes Peak is the sporty prototypr of Volkswagen’s fully-electric I.D. family. Today, we see what technology is capable of,” said Dr. Frank Welsch, Member of the Board of Management of the Volkswagen Passenger Cars brand Technical Development. “Every Volkswagen employee can be extremely proud of today’s result. I congratulate the team from the bottom of my heart. With a combination of outstanding engineering skill, passion and commitment, the team has managed to create a fantastic racing car in just eight months.